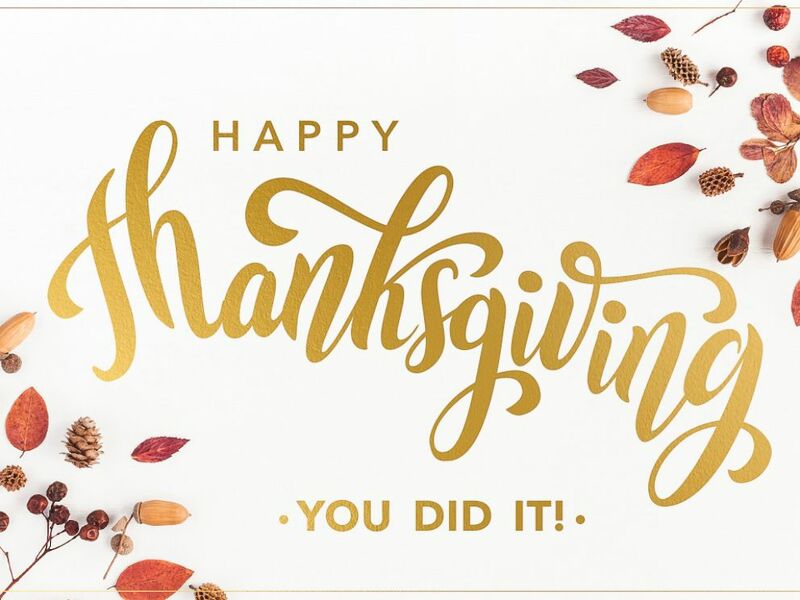 Turkey Day is fast approaching, and if it's your first time hosting the holiday or if you're looking to simplify things this year, this is a one-stop shop to pull off an incredible Thanksgiving with ease. From shopping lists and recipes to must-have kitchen tools and tips from food experts, this guide will help you whip up Thanksgiving like a pro. Countdown to the carving with "GMA" and follow along below. Plus, check out our shoppable list for all the cooking essentials you'll need. 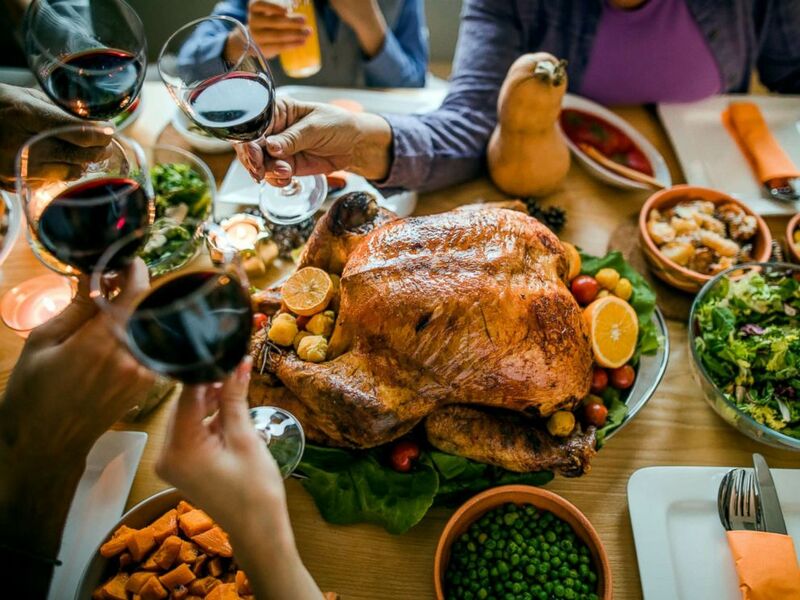 At the 14-day mark, it's time to start asking yourself key questions that will help make your life easier on Thanksgiving, according to New York City food stylist and Haven's Kitchen cooking instructor Kelly Janke. Janke, who is used to cooking with, and for, a crowd, said now is the time to square away your guest list. It may seem basic but it's critical to ensure you have enough food to go around, Janke explained. Ask if anyone has dietary restrictions, which will help determine components of your menu. What kind of turkey are you going to make? Sides? Traditional? Spatchcock? Fried? Brined? The turkey is the main event, so determine that first, and then plan the sides you and your guests will gobble up. "It's Thanksgiving -- people have deep nostalgia for certain dishes," Janke noted. But "I can't emphasize enough having balance. You don't want everything to taste the same, you want to have variety! I always make sure to have at least one raw vegetable dish on my table. My favorite is a raw kale, beet and ginger salad. [It] helps cut through the heavy meal." You don't have to be a celebrity chef to create an incredible menu. But thanks to these delicious recipes from Food Network stars we'll be dining like the Barefoot Contessa herself. What size turkey do I order? Most stores have frozen turkeys which you typically want to buy a few days before and keep it in the fridge to make sure it is properly thawed in time to cook. The last thing you want is a half-frozen bird and no time to cook it! Can you delegate anything to family, friends, guests? Anything that you're really stressed about you can delegate to other people. It's Thanksgiving, it's supposed to be fun, you don't want it to be stressful. Just plan and you'll be fine! Pro Tip: Put someone in charge of wine or dessert so you can focus on the main event! Pies are a must-have on a Thanksgiving table and if you can, make them ahead and have them ready to go on the big day. This stock photo depicts a family toasting with a glass of wine before enjoying a Thanksgiving meal. Don’t let it be something you stress over! A simple cheese plate, olives, crudités or nuts will do. Have a fun seasonal cocktail with the appetizer and offer wine with dinner. Whether you eat at noon or 5 p.m. you'll want to have something out to munch on. What should you put on your shopping list? This largely depends on the recipes you're making, but Janke suggested compartmentalizing your shopping list into produce, dairy, dry goods, etc. to make shopping most efficient. Go to the store with a plan! Shop early to avoid crowds. What time will you want to sit down for dinner? This is a must so you know when to cook your turkey. Pro Tip: Don't leave too many dishes until the end. Think of how much oven and stove space you'll have once the turkey is removed. Ideally, you’d have space to cook a couple things at the end. Do you have the right containers to store all that food you're prepping? After you go shopping you will be prepping ingredients for certain dishes ahead of time. Make sure that you have good mixing bowls with lids, Tupperware and the right containers to store everything in so you don't have to transfer it multiple times. The same thought goes for any leftovers. If you're going to send it home with your guests figure out what to put it in and plan for that. Check out the complete, shoppable list here for all the essentials that will have you winning Thanksgiving. Grab your shopping list and pick up your turkey, spices, dry ingredients, produce and anything else on your list. (Onions, garlic, potatoes, sweet potatoes and squash do not have to be refrigerated and can be safely stored at room temperature/in a cool dark place for over a week.) Once all your ingredients are home, you can get them sliced and diced so that any dishes you're prepping a couple days out will be a breeze to put together. Janke said you should pick up the turkey at least four or five days before Thanksgiving. "And if it's frozen," she added, "then it should be in the fridge for a couple days at least." It's time to use those extra turkey bones and bits you asked for. Make your stock now and store it in the fridge until you're ready to make the gravy. Pro tip: "You can also use a whole bone-in chicken to make the stock for your gravy," Janke said. Decide what day you'll be doing the most prep work in the kitchen. Make a simple list or timesheet with any dish that needs to be finished in the oven on the day of. Double check that everyone is coming. Adjust accordingly if the guest list changes. If you're doing a seating chart, make festive place cards for your guests. Feel free to get creative. One idea Janke has always wanted to try is personalized sugar cookies with a guest's name in royal icing. Up to three days out Janke said it's time to make your cranberry sauce. "It's kind of like a jam, more or less, so it will stay once you make it," she said. Get your bread for the stuffing and tear it up to let it dry out. "Let it chill out on the counter for about a day or so before you start putting together your stuffing," Janke said. Any salad dressing can be made a couple days out. If you're making any flavored butter, whether it's for the bread or the bird, Janke said it can be whipped up now. Make your gravy. Using the stock that was made in advance you can make the gravy a day or two in advance. Make it with a roux (flour and butter) and then add wine and your stock. Whether you're going for a simple seasoning or stuffing the turkey skin with butter fresh herbs and aromatics you'll want to prep this the morning before Thanksgiving. Janke loves a dry brine or a 24-hour salt rub. Make your mashed potatoes. They'll save and you can heat them through before you're ready to serve. One side that Janke is particularly excited to serve this year is macaroni and cheese. "Mac and cheese is a new favorite on my table," she explained. "Cook the noodles the day before along with the bechamel for the sauce. Then all you have to do the day of is add it all together with the cheese, cook it and then -- boom! -- you have macaroni!" Did you decide to make the pies yourself? Good for you. Time to get baking. They can sit and they'll be delicious when you're ready to serve dessert. Recreate this bright and modern look on your table this Thanksgiving. It's time to set the table. We know you have a day until the guests sit down but if it's all done now you'll have one less thing to do on the big day. 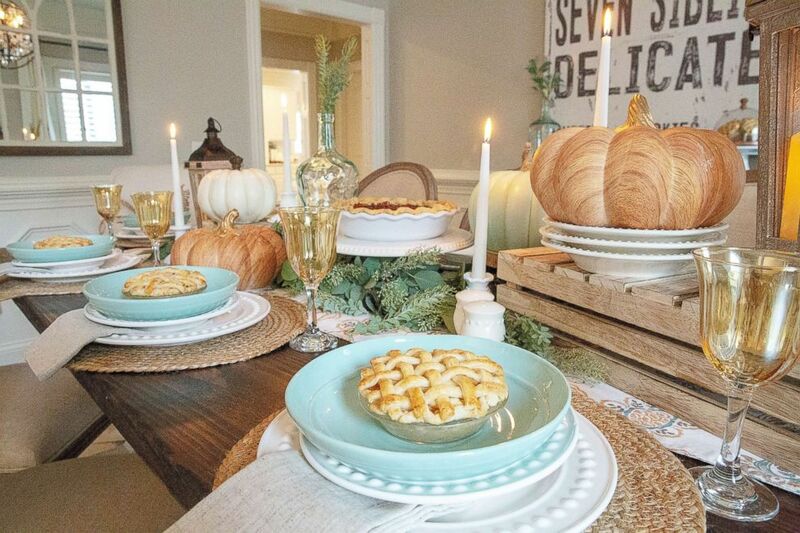 Check out our full guide to create a beautiful Thanksgiving tablescape. Pick out your platters, bowls and serving utensils the day before. Then you aren’t frantically choosing what to plate your dish with minutes before serving. Janke suggested getting prepared: "If carving intimidates you, watch a video on YouTube! We live in the age of YouTube, might as well take advantage." You made it to the main event. Let's get cooking! Remember today is all about taking care of that turkey. Stick to a time chart and schedule your cooking based on the recipes you choose. Give yourself an hour window for additional items to reheat while the turkey rests. If you're making rolls they should go into the oven first. Bake them in the early morning and let them sit out -- they'll be fresh the entire day. Take the bird out of the fridge and let it come up to room temperature before you pop it in the oven. As soon as you're ready to get cookin' set your "Turkey Timer" with Spotify. The music streaming service announced a new Thanksgiving feature that will recommend a curated playlist based on the size of your bird and how long your turkey needs to roast. There are six available playlist vibes to choose from. "Bastin'" will crank out Global Top 50 music. "All the Seasonings" is a collection of hip-hop and R&B tracks that will keep everyone dancing till dinner's ready. "Deep Fried" will bring out your inner cowgirl (or cowboy) with laid-back country music. "Fam Faves" boasts a mix of oldies and family-friendly tunes from Aretha Franklin to Demi Lovato. "Holiday Countdown" has all the Christmas classics. Finally, "Sabor de Sangsgiving" will bring some Latin flavor to the party with a collection of Hispanic hits. 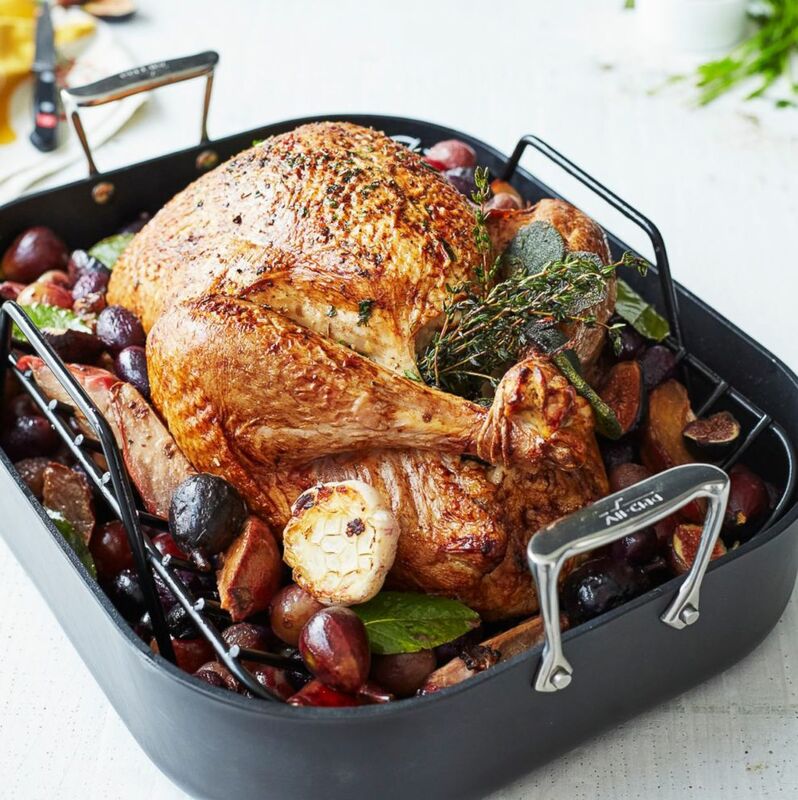 Roast your turkey with plenty of time for it to rest when you take it out later. Remove the turkey from the oven. Cover with foil and set aside for at least one hour to rest. Pop the stuffing in the oven. Heat the mashed potatoes and adjust seasoning to taste. Finish any other side dishes that need to heat through. Toss the salad and plate anything that's not already in a dish. Finish your gravy. Skim the oil off the turkey drippings in the bottom of the roasting pan. Add the prepared gravy (stock, roux and wine mixture) and finish in a saucepan. More is always better. Serve in gravy boats. Light any candles on the table. Gather your guests in the dining room, take your seat, grab a glass and raise a toast!